Have you ever seen a pup wearing one of the iconic colored vests that indicates that he or she is a service dog or service dog in training? Perhaps you noticed that the animal was not allowed to be pet or played with by strangers. That is because the dogs wearing these vests are trained to help individuals with disabilities, whether it is helping the visually impaired navigate the street, assisting veterans with Post Traumatic Stress Disorder or people with like conditions cope with day to day activities, or aiding individuals who cannot hear and need physical contact to lead them to a particular sound. This year, International Assistance Dog Week (IADW) is August 7-13, 2016. The goals of this week are simple: to honor assistance dogs, to raise awareness and educate the public about assistance dogs, to honor puppy trainers, and to recognize heroic acts by assistance dogs. How will you celebrate this week? 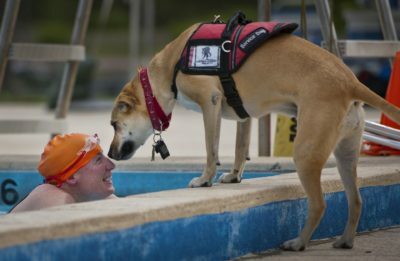 Do you have a special service dog in your life? 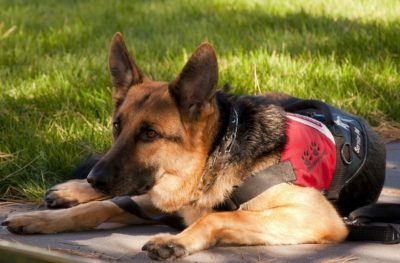 Even if you do not know a service dog personally, you can still take part in the celebration by attending many events that are held in recognition of the special week. In San Diego, California, there is a Leashes 4 Life Annual Celebration of Service Dogs in our Community event, in which dogs in training will be performing their learned skills and commands as trainers explain what the canines can do for their disabled owners. Even across the world in Adelaide, South Australia, The Royal Society for the Blind will have a puppy pen set up in Rundle Mall on August 10th where you can meet the puppies in training and receive some information about their program. 1.Dogs that are good for this type of job are typically calm and very intelligent, with a high level of concentration. 2. Common breeds used in service assistance are Labrador Retrievers, German Shepherds, and Golden Retrievers, however, almost any breed can do the job with training! 3. Assistance dogs typically receive training for six months to a year to learn to perform the tasks that their owner will need to be carried out. To learn more about International Assistance Dog Week visit http://www.assistancedogweek.org/, or to read personal stories, check out http://www.myassistancedoginc.org/stories/.